The National Hockey League (NHL®) and adidas today unveiled the new ADIZERO Authentic NHL jerseys and uniforms for all 31 NHL teams – including the Kings – which will make their on-ice debut with the 2017-18 season. Lighter – Featuring new cresting materials and construction technology, the ADIZERO Authentic NHL jersey reduces crest weight by up to 46%, while a single layer perforated numbering system reduces number weight by up to 60%, in order to deliver a new jersey that is up to 19% lighter when compared to the current NHL Jersey. 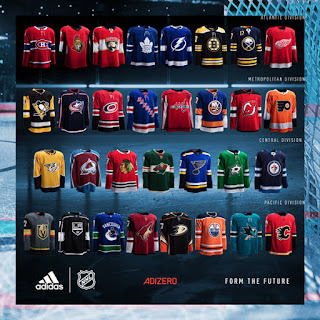 Cooler – The ADIZERO Authentic NHL jersey features adidas Clima® technology in each of the jersey fabrics to deliver breathability and enhanced performance. Combining moisture management technology and a streamlined silhouette to maximize air flow circulation with materials that are up to 133% more permeable than fabrics currently used on ice allows athletes to be cooler. Stronger – Constructed for durability, the ADIZERO Authentic NHL jersey fabrics are up to 27% stronger in burst testing and up to 72% tougher in abrasion testing compared to the current NHL jersey. "Adidas is a brand recognized worldwide for innovation and technology investment, creating constant innovation in high performance apparel," NHLPA Chief of Global Business Strategies Sandra Monteiro said. "The Players are excited to partner with adidas, creating a new milestone in hockey apparel, bringing edge, innovation and premium design to the game, specifically focused on their performance." Join the conversation on Twitter and Instagram via @adidasHockey, @adidasca, @NHL, @LAKings and https://www.facebook.com/adidas/ #FormTheFuture.